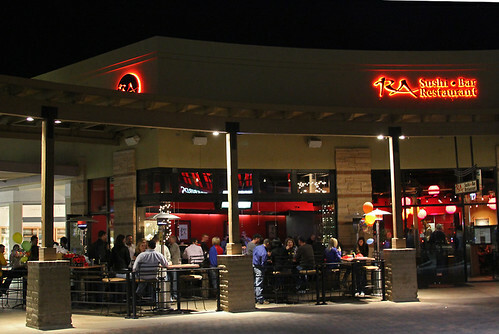 People were out at La Encantada Shopping Center in Tucson’s Catalina Foothills tonight enjoying food and drinks. University of Arizona Head Football Coach Mike Stoops was one of them. There are several places to eat and drink, including RA Sushi, North, Armitage Wine Lounge & Café, Blanco Tacos and Tequila, Firebird’s Wood Fired Grill, Red Velvet Cupcakery, Frost, and AJ’s Fine Foods (where they have a nice fireplace outside).